It’s Time for Tucson’s Annual Magical and Musical Ballet Adventure! Dancing in the Streets Full-Scale Production of the Nutcracker at Historic Fox Theatre Featuring live music provided by Civic Orchestra of Tucson. 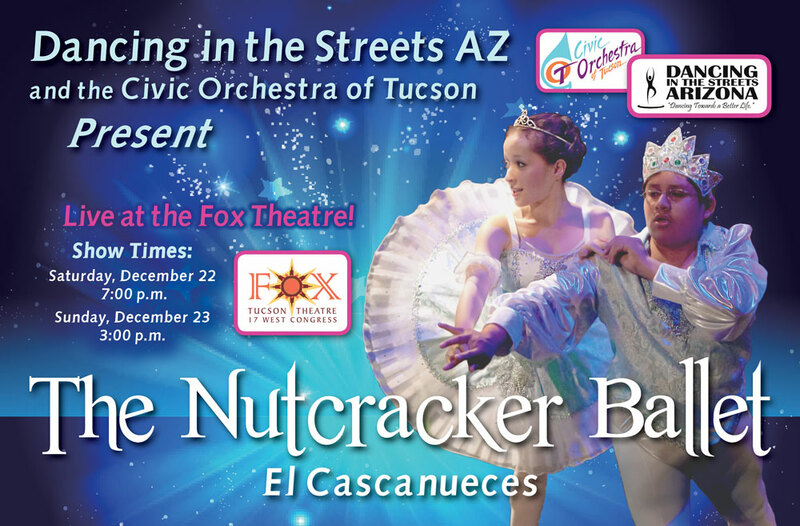 On Saturday, December 22, and Sunday, December 23, Dancing in the Streets Arizona (DITSAZ) will present the annual holiday favorite of the Nutcracker with showers of shimmering snow, special guests including Mayor Jonathan Rothschild, David Fitzsimmons, and more, surprise appearances. The Historic Fox Theatre glistening with light and merriment promise this year’s production to be the best one ever! Saturdays Performance is scheduled for 7:00 p.m. at the Historic Fox Theatre 17 West Congress Street, Tucson, AZ 85701 Sundays Performance is scheduled for 3:00pm at the Historic Fox Theatre.